For the first time ever, gamers outside Japan get to see an iconic console Final Fantasy title. Ouya, the tiny miracle box that smashed through its Kickstarter goals and has become an indie game talking point, has nabbed another title for its launch lineup. 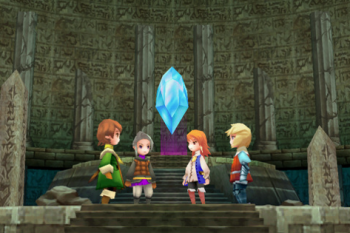 Final Fantasy III, a game that until now only was known in the West as a DS remake and iPhone title, will be on the Ouya. What's more, Ouya will be offering free demos of the game to its subscribers. "We're promising to deliver Final Fantasy III like you've never seen it before," Ouya announced on its Kickstarter page, "Hironobu Sakaguchi's third installment in the role playing game franchise will be updated to exploit Ouya's high-definition resolution in glorious graphic detail." Ouya is partnering with Square Enix to bring this missing piece of the Final Fantasy puzzle to its customers. Final Fantasy III is turn-based JRPG fun, in which you play as Onion Knights - Freelancers in the DS version - fighting against the forces of Darkness to save the world from chaos and destruction. Japanese gaming magazine Famitsu called it the eighth-best videogame of all time, and as a DS title it won acclaim. There were considerable changes - particularly to the interface - made for the DS, and it's been said that the Ouya edition will be the 3DS version of the original game. Ouya still has 8 days to go on its Kickstarter campaign, and has raised over $5.8 million so far; significantly more than its $950,000 top goal.